Yes came to Lakeland last Friday night to the welcome of 9,000 or so screaming Yes fans. Only the second rock act to perform at the brand new Lakeland Civic Center, Yes entertained the audience with songs selected from previous albums and a sneak preview of some music from their upcoming LP to be released this week. The Yesshow consisted mainly of material from their previous albums. Along with two songs from their new LP, "And You and I" and the title cut from "Close to the Edge" were performed along with "Ritual" from "Tales from Topographic Oceans". After going through so many personnel changes in the past few years, Yes surprisingly manages to keep their distinctive image. With only two of the original members, Jon Anderson and Chris Squire, still in the group, Yes hasn't lost any of the originally and appeal that has gained them so much notoriety in the U.S. and abroad. The latest personnel change, that of Patrick Moraz replacing the very popular keyboard player Rick Wakeman, has had its effect on the band nonetheless. Moraz is no match for Wakeman, but then again. Wakeman may have been too much of an overpowering influence in the Yes sound. At any rate Wakeman is now on his own and Yes seems to be more content with the present setup. Steve Howe, the very accomplished lead guitarist, was his usual frantic self. Howe's facial expressions, his tense grip on the guitar neck and his incredible lightning quick speed on any of the varied array of electric and steel guitars, proved his mastership of the six-stringed instrument. Jon Anderson, the leader of the group, was at no time lacking in his vocal leadership. His high pitched falsetto balanced the music with overtones of grace and sweetness. Chris Squire's powerful bass lines were prominent as is his style. Squire has an unusual uncanniness and knowledge of the bass guitar and its function in such intricately arranged music. Not to be delegated the usually subtle role of a bass guitarist, Squire surfaced and exposed aspects of the bass that had a certain freshness and vigor. An encore was granted at the close of the evening with the English musicians playing their most popular number, "Roundabout". Lakeland�s arena was brand new at the time and was taking all the big shows away from the Tampa/St. Pete area. We were happy �cause we didn�t have to drive quite so far. On the way to the show we blew a tire and my brother and I had it changed in less than 10 minutes � much to the amazement of the lady friend who was with us. YES were carrying an incredible amount of equipment on this tour. They were actually taking quadraphonic sound technology on the road and using it "live-in-concert." Remember back in the day they called it quadraphonic � a �70s prelude to what became 5.1 surround sound. Relayer hadn�t been released yet so we were all struggling to keep up with hearing music of this complexity for the first time. Sound Chaser was amazing. Chris Squire proved once and for all that great and fast licks could be executed on the bass guitar with clarity in an arena. It was a great show and of course we went right out and bought the LP so we could digest what we had been hit between the eyes with at the Show. We also thought Gryphon was great. That bassoon was just too cool! Not having bought tickets in advance my girlfriend and I drove up to Lakeland Civic Center and took our chances. We did get tickets. It was the usual Yes intro with the Firebird Suite.....but instead of Siberian Khatru Yes threw us a ringer and played a new piece. The album this song was off of was not yet in the stores so it took us by suprise.....and boy what a suprise...we were floored by this fresh, new and jazzy Yes styled tune. The rest of the concert was equally rewarding. I can affirm that Gryphon did open for Yes when they played at Lakeland Civic Center. To say that opening with 'Sound Chaser' was equivalent to a one punch knockout would be an understatement. I almost didn't make the show because a girl friend of mine in Atlanta wanted me to come up from Daytona to see George Harrison in concert on his Dark Horse tour. I believe the night before or after the Yes show on the 29th in Lakeland. It was a tough choice, but I chose to see Yes, and I'm glad I did. I believe the show was held at the Lakeland Civic Center. When I first saw Yes in early 1973, I was familiar with their material up to and including Close To The Edge. 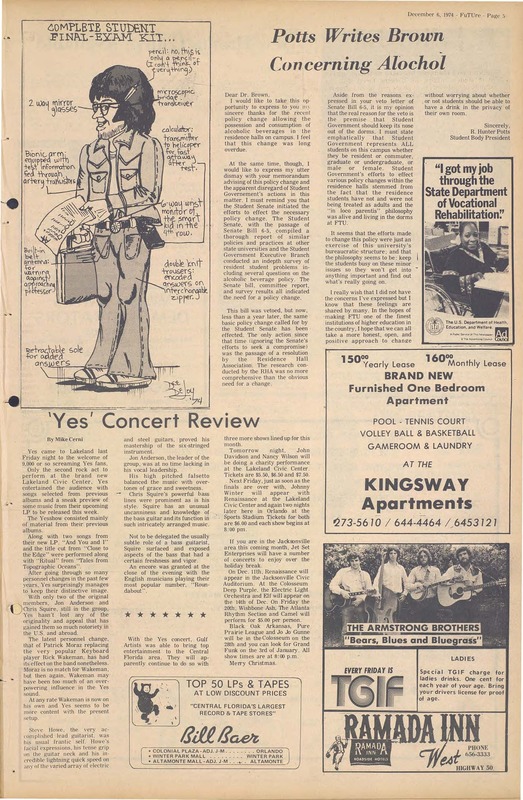 When I saw Yes again in Feb 1974, I had already been listening to Tales for a month so I knew what to expect. When I saw them Nov 29, 1974, Relayer was not even in the stores yet, so I didn't know what the new album would sound like. After the intro to The Firebird Suite they opened with Sound Chaser, I't floored me. The metallic power and majesty of that piece of music live was totally unexpected. They continued and played all of Relayer and I agree, this material is great on record but translates even better live, if you can believe that. It was a bit unusual to see Steve Howe use a Telecaster, but that just added to the metallic sound of the new material. Being a guitar and bass player and a plunker on keys, I've been a student of Steve's, Chris's and Rick's work. Totally inspiring and virtuotic. Pat Moraz was and is a great player but different than Wakeman. Jon was and is the best and Alan, though different than Bruford, is more Rock-n-Roll than jazzy, But I enjoy both. I'm not sure if Gryphon opened for them or not because I got to the venue right before Yes came on. Maybe some other Starship Trooper out there can enlighten us. Another memorable evening to say the least.